Deborah Kaye Allen (born January 16, 1950) is an American actress, dancer, choreographer, television director, television producer, and a member of the President's Committee on the Arts and Humanities. She is perhaps best known for her work on the 1982 musical-drama television series Fame, where she portrayed dance teacher Lydia Grant, and served as the series' principal choreographer. She currently portrays Catherine Fox on Grey's Anatomy. She is the younger sister of actress/director/singer Phylicia Rashad. Allen was born in Houston, Texas, the third child to orthodontist Andrew Arthur Allen Jr. and Pulitzer Prize-nominated artist, poet, playwright, scholar, and publisher, Vivian (née Ayers) Allen, She went on to earn a B.A. degree in classical Greek literature, speech, and theater from Howard University. She studied acting at HB Studio in New York City. She holds honoris causa Doctorates from Howard University and the University of North Carolina School of the Arts. She currently teaches young dancers. She also taught choreography to former Los Angeles Lakers dancer-turned-singer, Paula Abdul. Her daughter, Vivian Nixon, played Kalimba in the Broadway production of Hot Feet. After her trip with her family from Mexico, both Debbie Allen and her family decided to return to their permanent home in Texas. When she returned to her home in Texas, Debbie Allen auditioned at the Houston Ballet School at the age of twelve. Even though her audition performance exceeded beyond the qualifications of admission, Debbie Allen was denied admission to the school due to systemic racism that had corrupted the process. A year after hearing this devastating news, Allen was given another chance and was admitted by a Russian instructor who accidentally saw Debbie Allen perform in a show. Once admission recruiters from the Houston Ballet School became aware of the situation, they allowed Allen to stay in the institution because they were pleased with the talent she had showcased. This is not the only time Allen had experienced racism. When she was sixteen, she had a successful audition for the North Carolina School of the Arts, and was given an opportunity to demonstrate dance techniques to other prospective students applying to the institution. Unfortunately, Allen was rejected acceptance due to her body not being suited for ballet. In many cases, African American dancers were often discouraged from dance because they were told their body structure did not fit the preferred stereotype ballet dancer's body. This prejudice effectively barred many talented and skilled dancers from ballet. After receiving numerous rejections, Allen decided to mainly focus on her academics and, from then on, was well on her way to the start of her career. Debbie Allen had her Broadway debut in the chorus of Purlie. Allen also created the role of Beneatha in the Tony Award-winning musical Raisin. She first began receiving critical attention in 1980 for her appearance in the role of Anita in the Broadway revival of West Side Story which earned her a Tony Award nomination and a Drama Desk Award, she would receive a second Tony Award nomination in 1986 for her performance in the title role of Bob Fosse's Sweet Charity. One of her earlier television appearances was in the TV sitcom Good Times in a memorable 2-part episode titled "J.J.'s Fiancee'" as J.J.'s drug-addicted fiancée, Diana. Allen was first introduced as Lydia Grant in the 1980 film Fame. Although her role in the film was relatively small, Lydia would become a central figure in the television adaptation, which ran from 1982 to 1987. During the opening montage of each episode, Grant told her students: "You've got big dreams? You want fame? Well, fame costs. And right here is where you start paying ... in sweat." Allen was nominated for the Emmy Award for Best Actress four times during the show's run. She is the only actress to have appeared in all three screen incarnations of Fame, playing Lydia Grant in both the 1980 film and 1982 television series and playing the school principal in the 2009 remake. Allen was also lead choreographer for the film and television series, winning two Emmy Awards and one Golden Globe Award. In 1981, she had the important role of Sarah, the lover of Coalhouse Walker (Howard E. Rollins) who is killed while trying to defend him in the movie version of the best-selling novel Ragtime. The same role earned a Tony Award for Audra McDonald, for her performance in the Broadway Musical . In an article from the Museum of Broadcast Communications, The Hollywood Reporter commented on Allen's impact as the producer-director of the television series, A Different World. 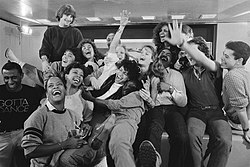 The show dealt with the life of students at the fictional historically black college, Hillman, and ran for six seasons on NBC. Debbie Allen was also selected to appear in the 1979 miniseries Roots: The Next Generations by Alex Haley where she plays the wife of Haley. In 2008 she directed the all-African-American Broadway production of Tennessee Williams' Pulitzer Prize-winning drama Cat on a Hot Tin Roof, starring stage veterans James Earl Jones (Big Daddy), her sister Phylicia Rashad (Big Mama) and Anika Noni Rose (Maggie the Cat), as well as film actor Terrence Howard, who made his Broadway debut as Brick. The production, with some roles recast, had a limited run (2009 – April 2010) in London. Allen has released two solo albums, 1986's Sweet Charity and 1989's Special Look which also had several singles off the album. In 1995, Allen lent her voice (as well directing the voice cast) to the children's animated series C Bear and Jamal for Film Roman and Fox Kids. In 2001, Allen fulfilled a lifelong dream by opening the Debbie Allen Dance Academy in Los Angeles, California. Allen's academy offers a comprehensive curriculum for boys and girls ages four to eighteen in all the major dance techniques including Classical Ballet, Modern, African, Jazz, and Hip-Hop. In addition, special workshops are held for concentration in the Peking Opera, Martial Arts dance techniques, Flamenco, Salsa, and Tap. Debbie Allen was awarded an honorary doctorate from the North Carolina School of the Arts, as well as from her alma mater, Howard University. Since 2007, Allen has participated as a judge and mentor for the U.S. version of So You Think You Can Dance. She had to step aside at the end of Vegas week in Season 4 to avoid perception of bias, as one of her former dancers, Will, made it to the top 20. Allen was appointed by President George W. Bush in 2001 as a member of the President's Committee on the Arts and Humanities. For her contributions to the television industry, Debbie Allen was honored in 1991 with a star on the Hollywood Walk of Fame at 6904 Hollywood Boulevard in the center of Hollywood directly opposite the Dolby Theatre at Hollywood & Highland Center. Allen was presented with the George and Ira Gershwin Award for Lifetime Musical Achievement, at the 1992 UCLA Spring Sing. Three-time Emmy Award winner for Choreography for the series Fame and The Motown 25th Anniversary Special. 10 Image Awards as a director, actress, choreographer and producer for Fame, A Different World, Motown 25, The Academy Awards, The Debbie Allen Special and Amistad. On February 4, 2009, Debbie Allen was honored for her contributions to dance and was presented with a Lifetime Achievement Award by Nia Peeples at The Carnival: Choreographer's Ball 10th anniversary show. Allen is married to former NBA player Norm Nixon, and they have three children: dancer Vivian Nichole Nixon, basketball player Norman Ellard Nixon Jr. (Wofford College & Southern University), and DeVaughn Nixon. Allen was previously married to Win Wilford from 1975 to 1983. She is the sister of actress/director/singer Phylicia Rashad (where she guest starred on an episode of The Cosby Show), and Tex Allen (Andrew Arthur Allen III, born 1945), noted jazz composer. ^ "Current Members". President's Committee on the Arts and the Humanities. Archived from the original on January 16, 2005. Retrieved August 13, 2008. ^ "Debbie Allen, Culver City, California". President's Committee on the Arts and the Humanities. 2008. Archived from the original on January 17, 2009. Retrieved August 13, 2008. ^ "Allen, Debbie (1950- ) | The Black Past: Remembered and Reclaimed". www.blackpast.org. Retrieved 2018-11-27. ^ Dunning, Jennifer. "TELEVISION; Debbie Allen Chips Away At the Glass Ceiling". Retrieved 2018-11-27. ^ "Famous Biographies & TV Shows - Biography.com". Biography. Retrieved 2017-03-30. ^ Darnell Hunt. "A Different World- U.S. Situation Comedy". Museum.tv. Archived from the original on February 10, 2006. Retrieved April 12, 2008. ^ "Debbie Allen – Hollywood Walk of Fame". ^ "The Carnival: Getting The "Groove On" For 10 Years". Hollywire.com. February 2, 2009. Archived from the original on March 21, 2012. Retrieved July 5, 2012. ^ Peter Vecsey (March 13, 2007). "BASN's Hometown Hero". blackathlete.net. Archived from the original on December 11, 2007. Retrieved April 12, 2008. ^ PEOPLE: "AND BABY MAKES FOUR". – The Dallas Morning News. – September 2, 1987. ^ Dave Mackall (May 31, 2007) "Nixon fondly remembers Duquesne". – Pittsburgh Tribune-Review. ^ Joseph Schiefelbein (October 17, 2008) "Spivery, Jaguars to begin practice", The Advocate. 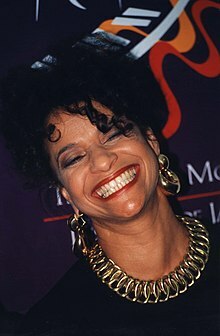 Wikimedia Commons has media related to Debbie Allen.